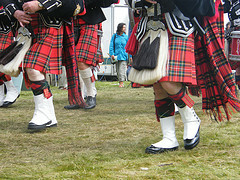 Most kilt owners have at least two sporrans, and many have considerably more. As with most kilt accessories the choice available is very extensive, and the occasion to which you are wearing your kilt would determine which one you wear. So how many different types are there? Well basically there are three, the first is for day or casual wear, then you have semi dress, which is suitable for slightly more formal occasions, and the third is the dress version. There is also a forth one which is used by the military, and often by pipe bands, but we'll get to that shortly. The reason that most kilt wearers have more than one is simply this, if you are going to attend a Highland Games for example, this is not considered the most formal of occasions. So therefor a day version would be suitable, whereas a dress one would look out of place (far to decorative). When attending a formal lunch or something similar, most people would wear a semi dress version, which will then give their outfit a more decorative look. And then for formal evening wear, you would without doubt choose to wear a dress version. The one exception would seem to be a wedding, although most ceremonies take place during the day, the bridegroom and male guests almost always wear full Highland Dress, and this of course almost always includes a dress version. 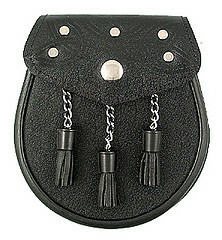 They are of course functional as well as decorative, and are normally worn with the kilt, after all your kilt doesn't have pockets and you need somewhere to keep your valuables. You do occasionally see a kilt being worn without one, but I personally think it looks much better when the sporran is included in the outfit. Once again a common exception are athletes competing at Highland Games, they don't wear one as it tends to impede their performance. As I mentioned earlier the military one is much different to those worn by civilians. It is decorated with horse hair, and is much larger than the ones you or I would wear with our kilts. In fact as you can see from the photo below the military version covers almost the entire apron of the kilt, and the horse hair swishes beautifully as the pipers march, which all adds to the spectacle of a pipe band. So how many do you need to accessorize your kilt? Well that depends on you, and how much money you wish to spend, but it's a good idea to have at least two. A day version so that you can wear your kilt casually, and a dress version when you wear your Highland Dress as formal evening wear. As I said earlier, many people have a collection and with such a vast selection available, you may well decide that two are just not enough. If you would like more information, or you have any questions related to the website, please drop me a line using the "Contact Us" page, I will be only to happy to help.